Life in Africa is often nasty, impoverished and short. AIDS kills 2.2 million Africans every year according to WHO (World Health Organization) reports. Lung infections cause 1.4 million deaths, malaria 1 million more, intestinal diseases 700,000. Diseases that could be prevented with simple vaccines kill an additional 600,000 annually, while war, malnutrition and life in filthy slums send countless more parents and children to early graves. And yet, day after day, Africans are told the biggest threat we face is – global warming. Conferences, news stories, television programs, class lectures and one-sided “dialogues” repeat the claim endlessly. We’re told using oil and petrol, even burning wood and charcoal, will dangerously overheat our planet, melt ice caps, flood coastal cities, and cause storms, droughts, disease and extinctions. Over 700 climate scientists and 31,000 other scientists say humans and carbon dioxide have minimal effects on Earth’s temperature and climate, and there is no global warming crisis. But their views and studies are never invited or even tolerated in these “climate crisis” forums, especially at “ministerial dialogues” staged with United Nations money. Al Gore refuses to debate any of these experts, or even permit questions that he hasn’t approved ahead of time. Instead, Africans are told climate change “threatens humanity more than HIV/AIDS.” More than 2.2 million dead Africans every year? We are warned that it would be “nearly impossible to adapt to the loss of the West Antarctic ice sheet,” which would raise sea levels by “5 to 15 meters.” That certainly would impact our coastal communities. But how likely is it? The average annual temperature in Antarctica is minus 50 degrees F! Summer in its Western Peninsula barely lasts two months and gets maybe 10 degrees above freezing for just a few hours a day. Not even Mr. Gore or UN computer models talk about raising Antarctic temperatures by 85 degrees F year-round. So how is that ice supposed to melt? Let’s not forget that sea levels have risen 120 meters since the last Ice Age ended. Do the global warming alarmists think cave men fires caused that? Obviously, powerful natural forces caused those ancient glaciers to come and go – and caused the droughts, floods and climate changes that have affected Africa, the Earth and its animals and people for millions of years. Just consider northern Africa, where green river valleys, hippopotami and happy villages suddenly got turned into the Sahara Desert 4,000 years ago. Scientists don’t know why, but it probably wasn’t Egyptian pharaohs building pyramids and driving chariots. However, the real problem isn’t questionable or fake science, hysterical claims and worthless computer models that predict global warming disasters. It’s that they’re being used to justify telling Africans that we shouldn’t build coal or natural gas electrical power plants. It’s the almost total absence of electricity keeping us from creating jobs and becoming modern societies. It’s that these policies KILL. The average African life span is lower than it was in the United States and Europe 100 years ago. But Africans are being told we shouldn’t develop, or have electricity or cars because, now that those countries are rich beyond anything Africans can imagine, they’re worried about global warming. Al Gore and UN climate boss Yvo de Boer tell us the world needs to go on an energy diet. Well, I have news for them. Africans are already on an energy diet. We’re starving! Al Gore uses more electricity in a week than 28 million Ugandans together use in a year. And those anti-electricity policies are keeping us impoverished. 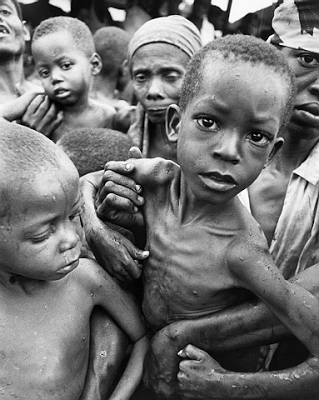 Not having electricity means millions of Africans don’t have refrigerators to preserve food and medicine. Outside of wealthy parts of our big cities, people don’t have lights, computers, modern hospitals and schools, air conditioning – or offices, factories and shops to make things and create good jobs. Not having electricity also means disease and death. It means millions die from lung infections, because they have to cook and heat with open fires; from intestinal diseases caused by spoiled food and unsafe drinking water; from malaria, TB, cholera, measles and other diseases that we could prevent or treat if we had proper medical facilities. Hypothetical global warming a hundred years from now is worse than this? Telling Africans they can’t have electricity and economic development – except what can be produced with some wind turbines or little solar panels – is immoral. It is a crime against humanity. Meanwhile, China and India are building new coal-fired power plants every week, so that they can lift their people out of poverty. So even if Africa remains impoverished – and the US and Europe switched to windmills and nuclear power – global carbon dioxide levels would continue increasing for decades. Even worse, the global warming crusaders don’t stop at telling us we can’t have electricity. They also campaign against biotechnology. As American, Brazilian and South African farmers will tell you, biotech seeds increase crop yields, reduce pesticide use, feed more people and help farmers earn more money. New varieties are being developed that can resist droughts – the kind Africa has always experienced, and the ones some claim will increase due to global warming. Environmental radicals even oppose insecticides and the powerful spatial insect repellant DDT, which Uganda’s Health Ministry is using along with bed nets and modern ACT drugs to eliminate malaria. They claim global warming will make malaria worse. That’s ridiculous, because the disease was once found all over Europe, the United States and even Siberia. Uganda and Africa need to stop worrying about what the West, the UN and Al Gore say. We need to focus on our own needs, resources and opportunities. We don’t need more aid – especially the kind that goes mostly to corrupt officials who put the money in private bank accounts, hold global warming propaganda conferences and keep their own people poor. We don’t need rich countries promising climate change assistance (maybe, sometime, ten years from now), if we promise not to develop. We need to stop acting like ignorant savages, who thought solar eclipses meant the gods were angry with them, and asked witch doctors to bring the sun back. We need to stop listening to global warming witch doctors, who get rich telling us to keep living “indigenous,” impoverished lives. We need trade, manufacturing, electricity and transportation fuels to power modern industrial economies. We need to do what China and India are doing – develop – and trade more with them. That is how we will get the jobs, prosperity, health and environmental quality we deserve.